We’d love your help. Let us know what’s wrong with this preview of Tail Gait by Rita Mae Brown. Spring has sprung in Crozet, Virginia—a time for old friends to gather and bid farewell to the doldrums of winter. Harry and her husband, Fair, are enjoying a cozy dinner with some of the town’s leading citizens, including beloved University of Virginia history professor Greg “Ginger” McConnell and several members of UVA’s celebrated 1959 football team. But beneath the clo Spring has sprung in Crozet, Virginia—a time for old friends to gather and bid farewell to the doldrums of winter. Harry and her husband, Fair, are enjoying a cozy dinner with some of the town’s leading citizens, including beloved University of Virginia history professor Greg “Ginger” McConnell and several members of UVA’s celebrated 1959 football team. But beneath the cloak of conviviality lurks a sinister specter from the distant past that threatens to put all their lives in jeopardy. To ask other readers questions about Tail Gait, please sign up. Does anyone know why in the last two books Harry has been named Harriet instead of Mary Minor? In Tail Gait, page 101 (hardback edition), she introduces herself as Harriet Harristeen but in the character intros she's still called Mary Minor. I think it was this way in Nine Lives to Die as well but it called her Harriet closer to the front of the book. Has anyone else noticed this? Joanne Bowman In earlier books, Harry got her nickname from her married surname, Haristeen. I wondered that too. Maybe Sneaky Pie has a ghost writer! I also noted on page 30 when Cooper is first questioning Harry following Ginger's murder, they are having tea. "You didn't study with him," said Susan. Only Cooper and Harry and the pets are in there at this time. Also, was anyone else a little confused about the different times that the players were playing/in school? This cozy series - set in Crozet, Virginia - was once a favorite of mine. The main character, 'Harry' Harristeen, was a divorced postmistress and amateur sleuth. Harry solved mysteries with the help of her 'talking pets', two cats and a corgi. The lovable animals commented on Harry's activities, philosophized about people, rode mail carts around the post office, protected Harry, and helped solve crimes. The stories also had an array of recurring characters that added fun and depth to the the tales. Most importantly, the mysteries were interesting, with plenty of suspects and clues. The last few books in the series, however, were more political diatribes than cozy mysteries and I decided I'd had enough. Nevertheless, I decided to check this latest addition out of the library. This book is more of a historical novel about the American Revolution than a mystery and many of the well-liked recurring characters are absent or marginally present. As for Harry, she's now re-married and living on her farm. Thus, there's no chit-chatting with folks in the post office or snacking on baked goods prepared by fellow postmistress Miranda - which was an entertaining aspect of previous books. The talking pets are still present, but not as fun as they once were. The story: A beloved retired history professor, Greg "Ginger" McConnell, whose specialty is researching and writing about the American Revolution, is shot on the golf course. Harry and a cadre of college football players - who were Ginger's students decades before - are profoundly grieved. Soon afterwards the death of another person with a connection to Ginger occurs. Harry and the cops don't know anyone who disliked or had a grudge against Ginger. Thus Harry decides (for no obvious reason) that the murder probably was linked to Ginger's historical research. Unlike standard mysteries, there's not much questioning of suspects or searching for clues. Instead, Harry examines local geography, maps, and old records and becomes very interested in a historically accurate housing development under construction. The book alternates between the present and the past. In the 'now' parts Harry investigates the murders, caddies for her golfing friend Susan, assists some homeless people, and tends her farm and horses. In the 'then' parts the American Revolution has started and British prisoners of war are housed in a barracks in Virginia. The historical sections are depictions of the lives of the POW's, who were treated fairly well in the circumstances. They had beds and food and were sent out to work at local farms and businesses. The POWs were friendly with their guards and the local population, and many remained in the colonies when the Revolution ended. The story is okay, and the solution to the crimes makes sense. Still, the book seems more like an excuse to write about the American Revolution than a mystery. It would make more sense for Rita Mae Brown to publish literary novels about her areas of interest rather than add more psedo-mysteries to this (formerly well-liked) series. I wouldn't recommend this book to mystery fans but if you're interested in POWs during the American Revolution you might like it. Cats and mysteries, what a purr-fect, cozy combo! 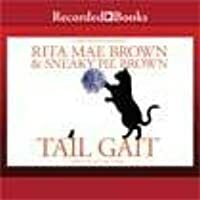 Tail Gait, Rita Mae Brown’s twenty-third Mrs. Murphy mystery is co-written by Brown’s own tabby feline, Sneaky Pie Brown. Ms. Brown’s favorite Southern busybody and her furry friends once again poke their muzzles into some fur-ocious business in this new tail of murder and greed. An early spring dinner party brings together a few alumni members of UVA’s acclaimed 1959 football team, a retired history professor, Greg “Ginger” McConnell and his wife Cats and mysteries, what a purr-fect, cozy combo! 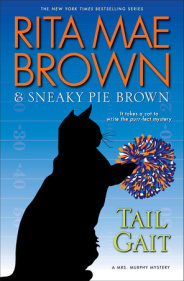 Tail Gait, Rita Mae Brown’s twenty-third Mrs. Murphy mystery is co-written by Brown’s own tabby feline, Sneaky Pie Brown. Ms. Brown’s favorite Southern busybody and her furry friends once again poke their muzzles into some fur-ocious business in this new tail of murder and greed. An early spring dinner party brings together a few alumni members of UVA’s acclaimed 1959 football team, a retired history professor, Greg “Ginger” McConnell and his wife, and our hero, Mary Minor “Harry” and her husband Pharamond “Fair” Haristeen. Not long after that evening, Ginger is shot while golfing. Because she was close to him and his wife, and because she simply can’t help herself, Harry starts sniffing around, accompanied by her cats Mrs. Murphy and Pewter and Tee Tucker, her faithful corgi. Well, Sneaky Pie, it seems you CAN teach a human new tricks. Ms. Brown has interlaced the present day Crozet, Virginia, chapters with fictional accounts from Revolutionary War times. She chose to focus on British prisoners of war and worked their personal stories into the landscape and history of modern day Virginia. This is a technique that I have not seen in any of the previous Mrs. Murphy books, and if I were to grade it, I would give it a B. At first I found it distracting from the main story because it seemed to have little connection to the murder. But Ginger, as his former students point out time and again, loved to make history come alive. I did find myself caring about what would become of Charles West and his dog Piglet, Captain Schuyler, and Mr. Garth’s daughters. I even looked up The Barracks in Charlottesville and was surprised to learn that there is such a place. Not only that, but the names of the present day owners, Claiborne and Tom Bishop, are used in the book! It made me wish I had learned history that way instead of having to memorize battles and dates. As for the motive and identity of the killer, well, that was not too difficult to figure out, although the solution lay in the past, and that was clever. I have read most, if not all of the books in this series, and I still enjoy the banter between the four-legged residents, although I don’t find it to be as witty as it once was. Also, I noted a few errors that made me wonder if Mrs. Murphy has a ghost writer, purr-haps? At one point, the wrong name of a character is used in conversation, which is not a big deal. But Harry is introduced as “Harriet,” not as Mary Minor Haristeen. That one had me scratching my head. Some have criticized Brown for making Harry too opinionated or judgmental or for inserting her own opinions into her fiction. Frankly, I think this is acceptable, and I noticed that Harry seems to have opened her heart this time, not only to homeless alcoholics but to transgendered people as well. There is a cast of characters at the beginning of the book, thankfully, as there are numerous good guys and bad guys, past and present to keep track of. There is also a roster of “the really important characters” – somehow I still get confused between Pewter and Mrs. Murphy, so I appreciate the list. I also found myself referring to the cast of soldiers quite frequently because I couldn’t keep straight who was fighting for which side. I did appreciate the research that went into this element of the book, and even though it was slow in parts, I found it quite fascinating. I rather liked the fact that the author(s) chose to have the captors and prisoners actually like each other and be kind to one another despite the hardships of the war. There were more than a few nice touches there. Overall, Tail Gait is a nice, comfy story to pick up when you want some quality time with your favorite pet. The 23rd Mrs Murphy mystery uses a different method than other books in this series: the solution for the murder of a UVA history professor has a lot to do with what happened during the American war of independence. Thus, there are two storylines, the usual one which tells about what is happening in 2015 and another one which is set during the war. The reader has to get used to two sets of characters. The ones in the 18th century are described quite well and I really liked this storyline, how it The 23rd Mrs Murphy mystery uses a different method than other books in this series: the solution for the murder of a UVA history professor has a lot to do with what happened during the American war of independence. Thus, there are two storylines, the usual one which tells about what is happening in 2015 and another one which is set during the war. The reader has to get used to two sets of characters. The ones in the 18th century are described quite well and I really liked this storyline, how it tells about the prisoners of war etc. I don't know much about this war and now I'm a little more familiar with it. The modern story and the actual crime however were actually quite poor. The characters weren't worked out very well, it was obvious why the professor had been killed and also who was the killer. Harry's naiveté towards danger kind of annoyed me, it was worse than in other volumes of the series. All in all I was rather disappointed by the book. I had high hopes for it because I enjoyed the last volume very much but this one just didn't grab me. My 24th Mrs. Murphy. I would have liked more Mrs. Murphy, Tucker and Pewter and less chapters set in the 1700’s, but it’s still one of my favorite series! I received an advance copy of this book through Goodreads as a First Reads winner. I have been disappointed in the last few books in this series, but I thought I would give this one a try – since I didn’t need to spend money to buy it. I was disappointed in this one as well. The plot was predictable. Someone Harry knows is murdered. Harry risks her life solving it while the cops are a step or two behind. As soon as the crime happens it is obvious who committed it and why. The chapters set during I received an advance copy of this book through Goodreads as a First Reads winner. The chapters set during the Revolutionary war were interesting from a historical standpoint but I don’t feel they moved the story along. Over the last several books Harry has become boring. She is no longer a person I’d like to know; critical of other people and how they live their lives – while touting her own perfection and that of her friends – apparently flawed people are not allowed in her sphere. Maybe that is why the old "regulars" don't show up any more. Even Fair was sent out of town for the entire book. Every few pages, the author throws in a lecture, from which kind of tea we should be drinking to what brand of truck we should be driving. While asides like this should add to the story these were delivered in a way that made this reader feel like I was being reprimanded by my elementary school teacher. I end up skimming through the pages to miss all that filler. Maybe the worst part for me is that the animals don’t seem to play as big a part in the story. When I first started reading the series, I was drawn to the interaction among the three friends, but now their roles have diminished – taking the humorous by-play with them. I think this will be my last Mrs. Murphy book. They are no longer worth the time it takes to read them. If you want a good story, go back and read the first 10 - 15 books in the series. Note to editor: the date on Chapter 15 is wrong in my advance copy. I would like to thank NetGalley and Random House Publishing Group - Bantam Dell for giving me the opportunity to read this book. I have not read a Rita Mae Brown book in years. I loved Harry and the animals, Tucker, the Corgie and the two cats, Mrs. Murphy and Pewter. I always thought it would be funny seeing someone driving around and taking their cats places, the dog no problem. Don't forget the two horses, snake and opposum in the barn . It's cute how the author has the animals talk amongst e I would like to thank NetGalley and Random House Publishing Group - Bantam Dell for giving me the opportunity to read this book. I have not read a Rita Mae Brown book in years. I loved Harry and the animals, Tucker, the Corgie and the two cats, Mrs. Murphy and Pewter. I always thought it would be funny seeing someone driving around and taking their cats places, the dog no problem. Don't forget the two horses, snake and opposum in the barn . It's cute how the author has the animals talk amongst each other. This story goes back and forth from present, to the past during the American Revolution. I think maybe that is why I wasn't as into this particular book as a lot of her earlier works. I'm not into history too much in my books unless it's a memoir, etc. The thing I liked is the author puts in this particular story about a real place that was a prisoner-of-war camp. The place called Camp Security in York County, PA fought to become a historic landmark. By writing this into the story, people can go there and donate or whatever to help out. I think that was the nice part. The book is about a friend that is murdered while out playing golf. Ginger McConnell was looking into old historical records, land aquisitions, etc. and this leads to his murder as there is always someone evil trying to hide something in these mystery cases. I think people that love history and mysteries will greatly enjoy this book. I had vowed when finished my last Mrs. Murphy book, to never read another - I obviously broke my vow. While this book still doesn't live up to Ms. Browns earlier works, it is much better than the last book of hers I read. This book still tries to 'teach' us good things, but not as forcefully as the last few. There is less politicking and more about history, less about organic farming and the hazards of eating/using non-organics products and more mystery. And thank you Gods and Goddesses for this I had vowed when finished my last Mrs. Murphy book, to never read another - I obviously broke my vow. While this book still doesn't live up to Ms. Browns earlier works, it is much better than the last book of hers I read. This book still tries to 'teach' us good things, but not as forcefully as the last few. There is less politicking and more about history, less about organic farming and the hazards of eating/using non-organics products and more mystery. And thank you Gods and Goddesses for this! This book actually has two stories going on at the same time, and until the ending you may not see the necessity of it. This was quite different reading for me, I really loved the secondary story almost more than the main story involving Harry and her mouthy (not too mouthy this time) animals. There are enough twists to keep me rather engaged in the story and less inclined to put it down to do something else. Again, I still think it isn't on par with her earlier works, but it seems that maybe Ms Brown is taking her readers concerns to heart and doing what she does best. The B story is set during the Revolutionary War, mostly in a prisoner of war camp in Virginia. The history is interesting. The A story is average for this series. very enjoyable reading......I love that the 2 cats and the corgi help to. solve the murders....fun! Professor McConnell is murdered on a golf course and this murder shocks the entire community. Harry knows that she has to look into the murder because it makes no sense to her. As she and her friends begin to snoop around looking for answers, someone confesses to the crime. Harry has a hard time believing the confession and continues to search for clues. What she eventually uncovers may just be the death of her, both figuratively and literally! The characters are well developed and well rounded. I loved reading about all the animals and the way they “help” solve the mystery. At times I felt like there were a few too many characters to keep track of. Although I did appreciate having a Cast Of Characters to refer to, the very fact that this was needed tells me there are a few too many. The writing style flows smoothly and the book is an easy read. The author is very descriptive and at times I felt like I was right there watching all the action. this was a great thing. But sometimes I thought the description was a little much, I did not need to know what everyone was eating, drinking or wearing. Sometimes it became a a bit overwhelming. I think the author did a good job writing about present day and the olden days (Revolutionary War days). My problem is that I am not much of a history person so my interest was not held that well. This is only my opinion and other readers may love having the history mixed in with the present. I would recommend this book to anyone who enjoys reading a cozy mystery. If you enjoy reading about historical event, In this case the Revolutionary War era, this is a must read book. I received a free copy of this book from NetGalley in exchange for a honest review. I would like to thank NetGalley and Random House Publishing Group-Bantam for the opportunity to read and review this book. If you need another fix of a "cozy" mystery, the latest in the series featuring Mary Minor "Harry" Haristeen and her corgi, Tee Tucker, as well as her two sleuthing cats, Mrs. Murphy and Pewter, is out this week. It is fun, fluff and fatalities all in one! Rita Mae Brown (and Sneaky Pie) have added a "twist" to the story set in Crozet, Virginia by adding a cast of characters who lived at the time of the Revolutionary War. Their actions intertwine with contemporary events, including multiple murd If you need another fix of a "cozy" mystery, the latest in the series featuring Mary Minor "Harry" Haristeen and her corgi, Tee Tucker, as well as her two sleuthing cats, Mrs. Murphy and Pewter, is out this week. It is fun, fluff and fatalities all in one! Rita Mae Brown (and Sneaky Pie) have added a "twist" to the story set in Crozet, Virginia by adding a cast of characters who lived at the time of the Revolutionary War. Their actions intertwine with contemporary events, including multiple murders. Once again, it is the animals who come to Harry's aid and the mystery, of course, is solved. While I enjoy escaping with these very light mysteries and found the addition of the Revolutionary War period to be an inventive way to freshen this series, I thought that some historical facts were handled awkwardly. We study the horrible conditions on British troop ships, but details about American camps are less well-known and could have been integrated even more effectively in this story. Overall, don't wait: Tail Gait is worth the read and a welcome addition to the series. I had two major issues with this book. First, I find that Brown adds in a lot of really unnecessary details. She gets bogged down in what characters are eating or wearing or how something works or who every single person is at an event, and it really draws me out of the story. My other big issue, which I also was bothered by in the other book I have read from the series, is that Brown puts a lot of her own opinions into the story, and I don't think she integrates them particularly well 1.5 Stars. I had two major issues with this book. First, I find that Brown adds in a lot of really unnecessary details. She gets bogged down in what characters are eating or wearing or how something works or who every single person is at an event, and it really draws me out of the story. My other big issue, which I also was bothered by in the other book I have read from the series, is that Brown puts a lot of her own opinions into the story, and I don't think she integrates them particularly well. In this book, some of the topics she clearly expressed opinions on were addiction, transgendered people at all-women's colleges, and homelessness. I'm not reading a mystery novel to get an author's opinion on society, so I get a bit annoyed by all of it. I also wasn't a huge fan of the flashbacks in this book because I didn't think they added much to the story, although to some degree I think the flashbacks were more interesting than the actual mystery. I just don't think Brown's books are for me. I find her books to be rather boring and somewhat predictable. I really enjoyed this book because it kept switching from present day to the Revolutionary War in Virginia. I loved the history, especially the account of the prisoners of war "barracks". Harry is saddened by the murder of an old friend and then the murder of a town drunk. What did the two deaths have in common? Why would someone want both dead? Harry's curiosity once again has her on the hunt to find the relation and then to find the killer. One of the things I like about these Mrs. Murphy book I really enjoyed this book because it kept switching from present day to the Revolutionary War in Virginia. I loved the history, especially the account of the prisoners of war "barracks". Harry is saddened by the murder of an old friend and then the murder of a town drunk. What did the two deaths have in common? Why would someone want both dead? Harry's curiosity once again has her on the hunt to find the relation and then to find the killer. One of the things I like about these Mrs. Murphy books is that although the animals are included as part of the cast of characters, they center on Harry and her solving mysteries. Of course after reading of so many murder mysteries Harry solves, I have to wonder about the city of Crozet having so many deaths. But most of the books, this one included, are delightful. As long as the author stays away from getting on her social issue/ political bandwagon. It has been awhile since I last read a book by Sneaky Pie Brown and her human (Rita Mae Brown) . This is a very enjoyable addition to the series. Beloved history Professor Ginger MacConnell is murdered on the golf course. His former students, who live in the UVA area, are mostly all successful business men. They are making money in various parts of land development, building high end homes. Harry and her pets are still sleuthing their way through these books and the Read as an ARC from NetGalley. It has been awhile since I last read a book by Sneaky Pie Brown and her human (Rita Mae Brown) . This is a very enjoyable addition to the series. Beloved history Professor Ginger MacConnell is murdered on the golf course. His former students, who live in the UVA area, are mostly all successful business men. They are making money in various parts of land development, building high end homes. Harry and her pets are still sleuthing their way through these books and they will solve the crime. The animal dialogue has always been a charming aspect of the stories and the beautiful central Virginia countryside is detailed so very well as spring blooms. Over the years I have enjoyed reading about antics of Mrs Murphy, Pewter and Wee Tucker their comments between themslves and the other animals the snake, opossum, owl, coyote and fox. I like the comments on their human companions. This book did not disappointed. I found both stories extremely interesting and well written. I did not like the format as it disrupted the thread of the stories. It is a lesson on how events that occur in the pass effect what happens today. I would recommend this book Over the years I have enjoyed reading about antics of Mrs Murphy, Pewter and Wee Tucker their comments between themslves and the other animals the snake, opossum, owl, coyote and fox. I like the comments on their human companions. This book did not disappointed. I found both stories extremely interesting and well written. I did not like the format as it disrupted the thread of the stories. It is a lesson on how events that occur in the pass effect what happens today. I would recommend this book to anyone especially those interested in animals and early American history. I love Rita Mae Brown's Sneak Pie and his animal friends, Tee Tucker, Pewter and Mrs. Murphy, who all appear in the books. I believe that this is the 25th book in this series. I have read all of them and hope that there are many more to come. I keep thinking that the book that I am now reading is the best so far until I get to the next book and decide that this is the best ever. The introduction of all the characters that Ms. Brown takes the time to list is really very handy. This book was writt I love Rita Mae Brown's Sneak Pie and his animal friends, Tee Tucker, Pewter and Mrs. Murphy, who all appear in the books. I believe that this is the 25th book in this series. I have read all of them and hope that there are many more to come. I keep thinking that the book that I am now reading is the best so far until I get to the next book and decide that this is the best ever. The introduction of all the characters that Ms. Brown takes the time to list is really very handy. This book was written in two different perspectives, Harry (Mary Minor) Haristeen and from an officer in the Revolutionary War. This book was so well written that it wasn't a bit difficult to keep track of. FTC Full Disclosure - A copy of this book was sent to me by the publisher in hopes I would review it. However, receiving the complimentary copy did not influence my review. I love Rita May Brown and Sneaky Pie Brown's mysteries. With her companions, Tucker the Corgi, Pewter and Mrs. Murphy, the cats, she out to solve the latest murder in her neck of the woods. The long term characters are enduring and reading one of her stories set in Virginia is like visiting an old friend who has exciting news. These books have become so preachy, and yet I always read them. Amazing that she talked about transgender with Kaitlyn Jenner coming out. Especially knowing that this book was in the works well before that happened. I've been really disappointed with the last few Mrs. Murphy Mysteries I've read. They have largely gone from being charming to being flat, and sometimes rather preachy. But I'm an optimistic sort, so I keep picking them up and reading them. This was was not as bad as the last few I read, but I found the murder motive to be an afterthought, and not very plausible. And the chapters that cut away to the revolutionary war didn't really add anything to the plot, or enhance the story at all. I don't kn I've been really disappointed with the last few Mrs. Murphy Mysteries I've read. They have largely gone from being charming to being flat, and sometimes rather preachy. But I'm an optimistic sort, so I keep picking them up and reading them. A beloved history professor is killed, and the police are investigating everyone in proximity. But to solve this case, they will need to go back some years, actually, a lot of years. In this well-constructed mystery, Rita Mae Brown clearly illustrates that something done decades before can impact the future, in ways unpredicted. Told in past and present times, this mystery is a wondrous tale of war and greed and of true love. Truth, eventually, will come out, one way or another. Fun read, enjoy the animals discussions! This particular book I’ve read before but was such an enticing storyline that I just kept enjoying it...... Rita Mae Brown is a convincing author with Very interesting characters. This was actually two stories, one about British prisoners in an American prison camp. A good majority of the prisoners stayed in America after the war was over. Present day story is connected to POW story by a deed. Having been in Virginia in March and having revisited the battlefield at Yorktown, I could picture certain things in this book much more vividly than if I’d read it sooner. This was an excellent and intriguing weaving of history and imagination. I like all the history in this book. I wasn’t sure I would like the shifting between the past and the present but I really enjoyed learning about a part of history that I had never thought much about. I also liked trying to guess how the two stories came together. It’s another great mystery. I really enjoy this series and it's something light to read between the more intense books. This book was particularly good because of the flashback story to the Revolutionary War and how it intertwined with the present day mystery. I have loved Rita Mae Brown's Mrs. Murphy series for years and the new ones blending history tales as a backdrop for the modern stories are wonderful. I love her books, I love history, this blend is perfect.